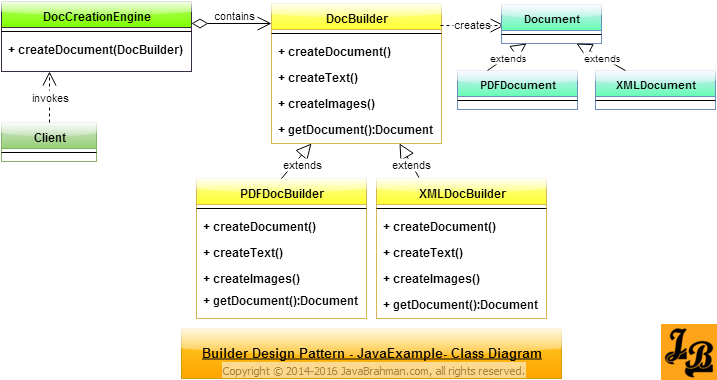 This tutorial explains Builder design pattern in java with UML class diagram. It then takes an example scenario in java and explains it with class diagram and code. Introduction: Builder Design Pattern is a creational design pattern among the Gang Of Four(GOF)Article on GOF Patterns & their types Design Patterns. Being a creational design pattern, the Builder pattern deals with the design of how the object creation is managed. In a Builder Design Pattern implementation the construction of a complex object is separated from its representation. This enables us to create multiple representations using the same construction process. In Builder Pattern the class which invokes the the multiple steps to create sub-parts of the final product is loosely coupled to the actual implementation of those steps using an abstract Builder interface in between. Algorithm for creating the product needs to be independent from the sub-parts’ creation & assembly: Builder pattern is useful when the algorithm/steps for creation of a final complex product needs to vary independent of the sub-components for that product which are created and then assembled to get the desired product. Different representations of the product are possible: The product being created has variants which are different representations of the same basic product. Builder is the base class which all the ConcreteBuilder instances extend. Director holds a reference to a Builder. Director directs,i.e. is responsible for, creation of the product using the interface provided to it by Builder. Each ConcreteBuilder is responsible for a variant of the product. While buildPart() method triggers the creation of sub-part, the getResult() method is provided to fetch the final assembled product. Product object represents the complex final product which is being constructed. Creating text for PDF Document. Creating images for PDF Document. Creating text for XML Document. Creating images for XML Document. Document is the base class for all documents. PDFDocument & XMLDocument are two types of Documents. DocBuilder is the base class for Builders. It defines the methods which DocCreationEngine invokes to create a document. PDFDocBuilder and XMLDocBuilder are concrete builders for PDF and XML Documents respectively. DocCreation engine is the Director, i.e. it invokes the methods on DocBuilder instance passed to and creates the required document. Client invokes the DocCreationEngine with the specific DocBuilder concrete class depending on the type of document it wants to generate. Once the document has been created, Client calls getDocument() method on the concrete builder instance to get the PDF or XML document. Output shows the sequence of creation of PDF and XML Documents. In the above tutorial we understood what is Builder design pattern and the main scenarios in which it is applicable. We then looked at the UML class diagram for Builder Design Pattern & its explanation, a Java Use Case implementing Builder pattern with its class diagram and code for the classes shown in the class diagram, followed by explanation of both the class diagram & code. This concludes the tutorial on Builder design pattern. Previous PostJava 8 Repeating Annotations Tutorial using @Repeatable with examplesNext PostJava 8 Error-The target type of this expression must be a functional interface.